HomeBlogQuickBooks ErrorHow to Fix QuickBooks Unrecoverable Error? QuickBooks unrecoverable error: With the wide range of services offered by QuickBooks, there are a lot of technical issues and bugs attached to it as well. Customers face these issues on a day to day basis, and these are mainly related to data issues, network problems, crashing of the application on start-up, failed transactions etc. QuickBooks unrecoverable error is one of them. The QuickBooks accounting software, in general, is quite easy to use; you may still encounter some errors. One of the most common ones is the “Unrecoverable Error”. Our QuickBooks not working team is here with an article describing everything you should know to deal with it. It is important to know that this error indicates your QuickBooks has experienced ‘critical application fault‘. The unrecoverable error typically displays one of 50 different numeric error codes, each containing 10-digits in a “5-digits space 5-digits” sequence (e.g. 15144 57386). It appears mostly when you open your file or when you click the Save, Print, or Ship icon at the top of a transaction. A window or window(s) were being left open while closing the file. So, under either condition, we will have major data corruption that locked us out of QuickBooks which is wholly unacceptable. The following solutions are some of the possible fixes for the QuickBooks error. Before fixing, you make sure that your QuickBooks Desktop is up to date. Read how to update QuickBooks to the latest released version. Solution 1: Don’t let QuickBooks open all Windows during Start-up. Double-click on the QuickBooks icon and press the Alt key. The application may then ask for the user password. Enter the User password after releasing the Alt key. A file will open, press Alt key again. Wait till the file opens completely and release the Alt key. Solution 2: Change the way you save the form. Use either Save & Close button, or the Save & New button at the bottom of the form to save the transaction. While saving, do not leave the cursor on a blank line of the sales form. Rather, leave it on a line that has an item filled in. Click To Be Printed before saving the transaction. For Print, go to File and Print Forms. In case, you are receiving the unrecoverable error in QuickBooks while printing, make changes/edit your Preferences. Click clear the Save transactions under the Company Preferences Tab, before clicking the printing check box. Tap on OK to save changes. Go to the Run option from Start Menu & type bat to re-register. Before following the steps mentioned below, make sure QuickBooks is closed. Keep holding the CTRL key until the New Company Open screen appears. Choose any of the sample company files from the list that opens up. Run QuickBooks repair tool. This repair tool easily detects damages and fix it. If any of the solutions doesn’t work, select repair Microsoft.NET Framework. Uninstall all the related files and download QB again. These solutions for unrecoverable error QuickBooks are tried and tested. We are sure one or the other fixes listed here will help you overcome the issue you are facing. 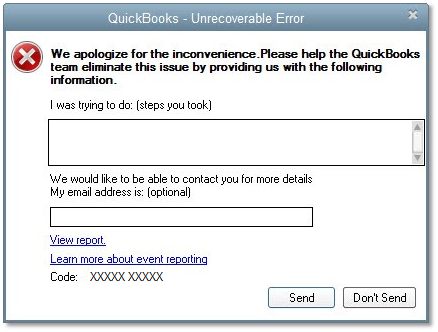 That’s all about QuickBooks unrecoverable error. If you still have any question, you can dial our QuickBooks technical support phone number +1-855-441-4417 to get help and support.